I have a confession. I’m from ‘round here– Brookline to be exact. For those still new to the Boston area, Brookline is an adorable little town west of Boston just about a 20 minute walk from BU west. It is best known for being the birthplace of JFK, Conan O’Brien and of course, a Mexican joint called Anna’s Taqueria. Although the Anna’s Taqueria has become a chain restaurant, which caters at six locations, it remains hugely popular among its local fanbase, which is comprised largely of students from the Boston area. Having gone there numerous times in the past, I decided to take another trip down to Anna's Taqueria as a food critic. An always-bustling environment makes the restaurant look formidable from the outside, but my rule of thumb is that a crowded restaurant is a good one. The lines do move quickly though, due to the fast burrito wrapping staff. Standing in line for a few minutes, I noticed that the vast majority of people go for a burrito, which is absolutely the right decision. It’s not that the other choices are bad, but there’s something about Anna’s burritos that makes them so irresistible. The most important factor for me is the meat. As a spicy food lover, I was impressed at the number of options for me. The Chile Verde is fantastic- pork cooked in a variety of peppers. The Chicken Ranchero is a bit spicier, but it is nothing compared to the Steak en Salsa Roja, which is not for the faint of heart. Something a little more adventurous that I have not yet tried is the Lengua– slow cooked cow tongue. I had always been a believer that you will enjoy Anna’s more if you like spicy food. To test this theory, I ordered the plain grilled chicken and boy, was I wrong. 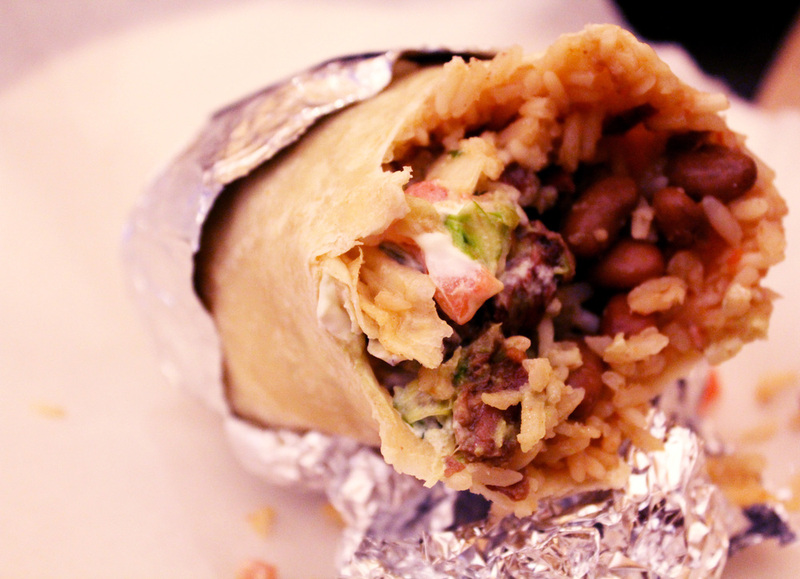 What makes Anna’s burritos so delicious has much more to do than the meat. The tortilla, which is steamed with cheese, gets an amazing texture that I have yet to see replicated by another Mexican place. The rice and beans are well cooked and soft. The salsa is tangy and complements the lettuce, guacamole and sour cream. I added the jalapenos and hot sauce for the extra kick. The prices are all very reasonable. Expect to drop between 6-8 dollars for a satisfying meal. So take it from a burrito aficionado who’s from ‘round here. Go to Anna’s Taqueria for a meal, and I guarantee you will be back for more.